VIVA Gallery will kick off its 4th annual Artisan Market at its monthly First Thursday opening on November 5. 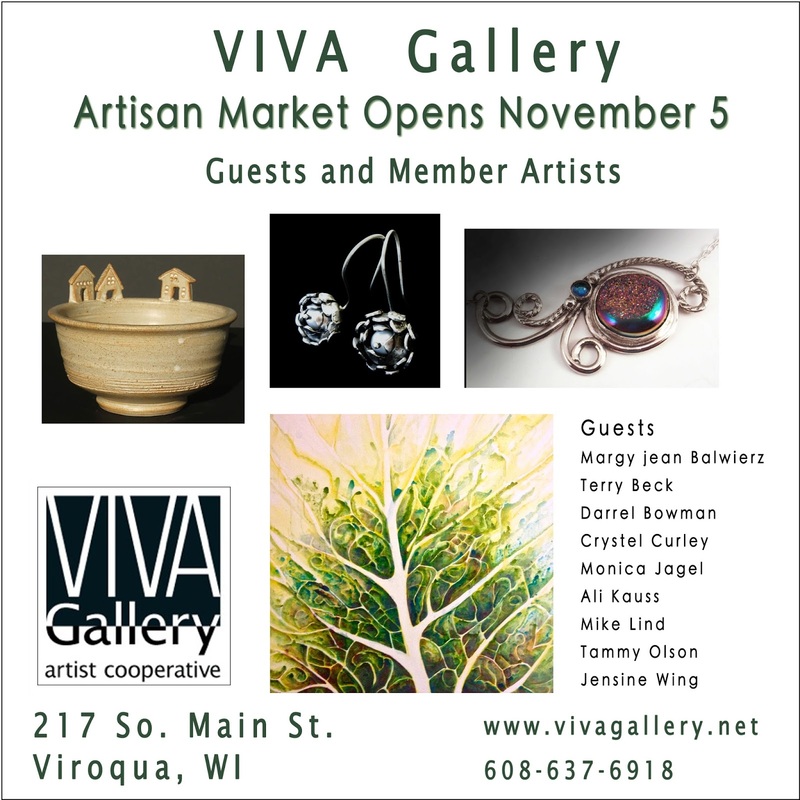 The market features the work of VIVA’s 18 member artists and several invited guest artists. With many different media on display, shoppers will have a delightful range of items from which to choose. And who wouldn’t like to choose beautiful and unique hand-crafted local items as gifts for the upcoming holiday season? You might want to wrap up some fiber arts, like an intricate woven vest from Kathleen Aaker, a nature-inspired eco-printed textile from Sharlene Bohr, a masterfully woven scarf from Angela Feltes, or a beautifully embossed leather purse, belt and bowl by Daniel Gilbertson, all member artists. Guest artist Crystel Curley demonstrates her love of the practical and tactile with her colorful layered pot holders. If pottery pleases you, the bowls, tea sets and mugs of Maureen Karlstad are perennial favorites as are the tiles of Mark Herrling. Guest artists include Margy Jean Balwierz, who adds her colorful hand-made stoneware tiles and bowls to the mix, and Darrel Bowman, with his intentionally functional stoneware. VIVA’s seven painters offer an amazing range of styles. The plein air paintings of Paul Bergquist and Deb Conlon capture the splendor of our Driftless landscape. The watercolors of Anne Tedeschi depict outdoor scenes and still lifes of indoor treasures; Bill Mapp’s watercolor and ink paintings portray people and animals in distinctive patterns. You’ll often find a small woodland creature in Fran Knapp’s ink paintings, which are a tribute to her natural surroundings. And you will likely find a cow or rooster among the oil paintings of Liz Quebe. Christine Larson’s bold and colorful paintings are a fun mix of contemporary and realism. And guest artist Mike Lind offers acrylics that explore the relationships between the topographical landscapes of the Driftless region and the flora and fauna (both natural and farmed) that inhabit these landscapes. Jewelry is always a perfect gift, and member artists make all styles of jewelry— beadwork from M’lou Wilkie, metalwork from Raelene Roberts, stone and wire works from Christine Larson and glass jewelry from Angela Feltes. Guest artist Ali Kauss handcrafts her work using the techniques of soldering, cutting, fusing, forging, reticulating, chasing, repousse and lots of hammering, while guest artist Jensine Wing is known for her lapidary. Member artists Ken and Michelle Workowski will have their popular rustic bark mirrors, poplar bark baskets and delicate lamp shades, all made from elements native to our area. Jerry Quebe’s intricately constructed and beautifully finished cutting and serving boards are a great gift item, as are guest artist Terry Beck’s hand-carved wooden spoons. Relief prints, etchings and monoprints by Mark Herrling, assemblages and photographs by Diane Dahl, prints by mixed media artist and illustrator Tammy Olson(a guest artist), and ornaments based on intricate color pencil drawings by guest artist Monica Jagel round out the incredible selection of artwork obtainable at VIVA. Seasonal and holiday greeting cards will also be available, as will fun, creative chocolates from Roots Chocolate. Made in small batches on a 4th-generation family farm, each chocolate is a little work of art.